Adults only luxury boutique hotel in Guanacaste, Costa Rica. Last spots available, fabulous rate. Contact us for an amazing special! 5 minutes away from Coco Beach! 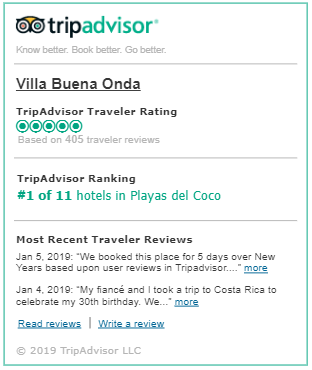 Take advantage of the occasional special offers at your luxury Villa Buena Onda Adults-Only Hotel. Some of our resort specials are for limited time, so stay tuned! Planning a family getaway or looking to travel with a group? Our villa is available these months for up to 23 guests with meals-included for all. We also have wedding services. Stay at the best villa rental in Guanacaste! Enjoy an all-inclusive stay with not only your meals included in a perfectly adults-only vibe, but also all your alcoholic and non-alcoholic drinks! My husband and I came to VBO for our honeymoon and before we left, we decided to return for our first anniversary. As I sit at lunch on our last full day, I'm looking at an amazing scenery, with a belly full of delicious food. An all-inclusive adults only boutique hotel in Coco Beach, Guanacaste, Costa Rica. Great ocean views, personalized service and privacy guaranteed. Del Ancla 200 oeste y 700 sur, Playas del Coco, Guanacaste, CR, 50503.